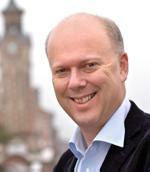 Chris Grayling is Member of Parliament for Epsom and Ewell, and Shadow Secretary of State for Work and Pensions. He was first elected in 2001 and since then has served as an Opposition Whip and as a Member of the influential Transport Select Committee. He was promoted to Shadow Health Minister in 2002 and then Shadow Higher Education Minister in 2003. After the General Election in 2005 he became a member of the Shadow Cabinet as Shadow Leader of the House. Chris was promoted to Shadow Secretary of State for Transport in December 2005. Following David Cameron’s reshuffle in July 2007 Chris moved to the Work and Pensions brief. He was educated at the Royal Grammar School, High Wycombe, and Sidney Sussex College, Cambridge, where he read history. After university, he joined the BBC’s News Training Scheme, and worked as a producer on BBC News and Channel Four’s programme Business Daily. He then moved to the business side of the media industry, working for a number of small and medium-sized production businesses before moving to the Employee Change Communication practice at international communications firm Burson Marsteller, where he subsequently became European Marketing Director. He is married with one son and one daughter.